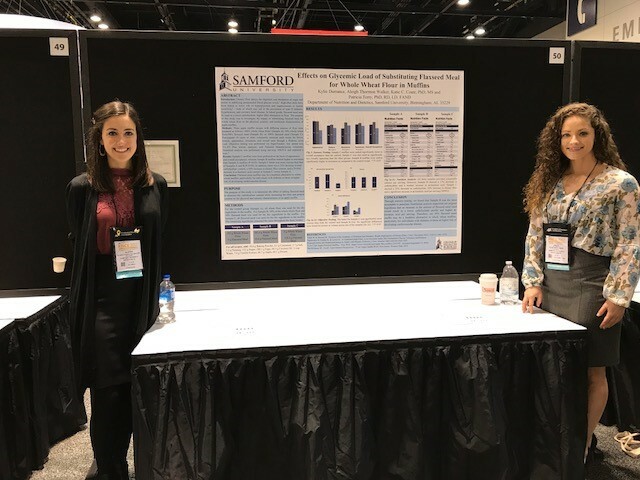 Samford University’s Department of Nutrition and Dietetics sent its largest contingent to the Academy of Nutrition and Dietetics’ annual Food and Nutrition Conference and Expo held recently in Chicago. Fourteen students and four faculty members attended this conference and presented four research posters—three of which received top honors. Prior to traveling to Chicago, students completed a course called Experimental Foods, which is designed to teach research methods and allow students to carry out their own studies. “The students take ingredients in recipes and modify them for what a clinical dietitian might use in a hospital,” said Pat Terry, professor and food labs director in the School of Public Health. For example, the course challenged students to create recipes with lower sodium, simple sugar, increased fiber and phytochemicals. Many of the students used the knowledge and skills they garnered in this class to create their research abstracts to submit to the conference. A total of 400 research abstracts were presented at FNCE, and only 40 of those abstracts qualified for the outstanding category. Out of the four abstracts submitted by Samford students, three were placed in the outstanding category. These projects were led by senior nutrition and dietetic majors Josey Hartley, Kylie Durrance, Aleigh Walker and Maddison Lupul. Abstracts were published in the Journal of the Academy of Nutrition and Dietetics in 2017. Lupul received top honors for her research, entitled “Evaluating the Protein Content in Chocolate Chip Cookies using Cricket Powder as a Flour Replacement." The conference provided students and faculty with a great opportunity to network with practicing registered dieticians and graduate program directors from across the country. Students attended a variety of lectures at FNCE, where they were able to learn about emerging topics in the field of nutrition and dietetics. Olivia Halverson is a journalism and mass communication major and a news and feature writer for Samford’s College of Health Sciences.